There are three small islands located 30min from mainland Bali by boat. This islands are called Nusa Lembongan, Nusa Penida and Nusa Ceningan. And there, the atmosphere is much less crowded and much more relaxed than Bali. We totally recommend them if you are looking for paradisiac beaches with crystal water and sandy beaches. To be sincere, the beaches in Bali are not really nice (except the ones in the northen part which are amazing). 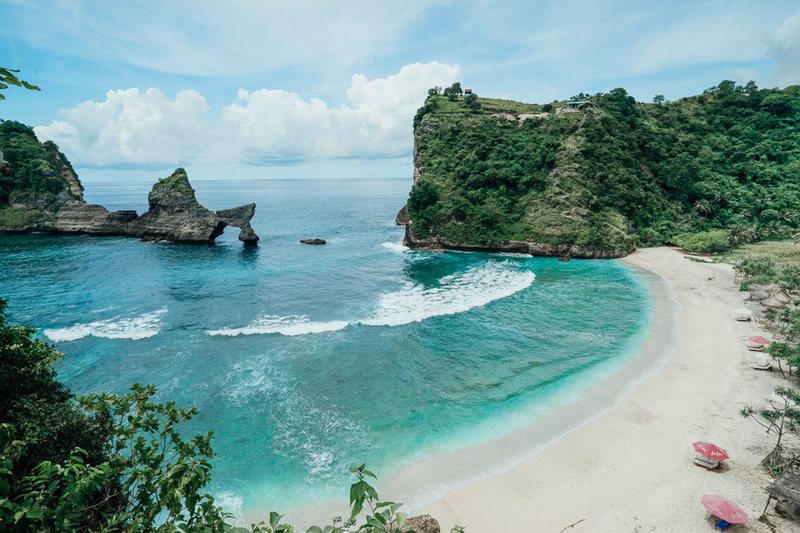 Those Bali islands are extremely beautiful and if you have time to go we totally recommend going, you will be impressed. Starting at Nusa Penida, where you can swim withManta Rays, then continue across choppy waters to Nusa Ceningan and swim in the lagoon. -Hire a local boat, paddle boat, gondola, stand up paddle board or kayak for less than IDR 100 000 (you may have to pay a bit more) and discover this quiet, relaxing and magical place. -Visit Dreamland beach, Sandy bay and Mushroom beach with white sand and crystal water. -If you are a surflover, this place is a famous surf destination. -Devil’s tears: you can admire the wild ocean hitting the cliffs with full force and watch the sunset. Do not get too close to the edge, because there are plenty of stories about tourists that (almost) drowned after the waves caught them by surprise. Popular sunset spot! You can come by motorbike or walking from nusa lembongan. Is the smallest island and you can explore it in few hours,. This will be the way to get to the island. -Blue Lagoon Cliff Jump place. After crossing the bridge we walked for about thirty minutes and headed straight to Blue Lagoon.The Nusa Ceningan Blue Lagoon is a rocky cove of the brightest blue water I’ve laid my eyes on. 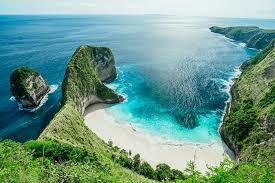 Nusa Penida is the biggest of the three Nusa Islands. From Nusa Lembongan, the boat to Nusa Penida took only 20 minutes , you can spend the whole day or also stay for one night. -The Pura Goa Giri Putri Cave is perched midway up the mountain, accessible by a steep winding staircase. -Peguyangan Waterfall: A steep cliffside trail comprised of blue steel stairs lead you down to the bottom of the cliffs and the waterfall. Also there is an excellent spot to see the migratory mola mola, which pass through the area from July to October. Hundreds of other fish species also enjoy the healthy reefs. We hope this post was useful ! If you’re traveling to Bali and you can devote 2 to 3 days to this beautiful island, by all means, go for it! Almost all the attractions in Nusas are free to visit. But in some places, they will ask you for 10k IND Rupiah, or less than a dollar, for parking your motorbike. Take a motorbike and enjoy the ride with stunning views! Be aware that the roads are not really good, go slow!